Porsche to replace engines of current 911 GT3 models! Sports car manufacturer Porsche will be replacing the engines of all 911 GT3* vehicles of model year 2014. This is the corrective action derived from intensive internal analyses that were initiated in response to two engine fires. Meanwhile, it has been confirmed that engine damage resulted from a loosened screw joint on the connecting rod. The loose connecting rod damaged the crankcase, which in both cases led to leakage of oil which then ignited. After becoming aware of the two accident cases, Porsche promptly took action to avoid any risk to customers by advising them to cease using the affected 785 vehicles until further notice and have them picked up by a Porsche Centre. Now, engines with optimised screw fittings will be used in all Porsche 911 GT3 vehicles of model year 2014 – including in those that have not been delivered yet. The relevant Porsche Centres are in direct communication with customers worldwide to discuss the further course of action. Porsche points out that no other 911 models or other model series are affected by this action. 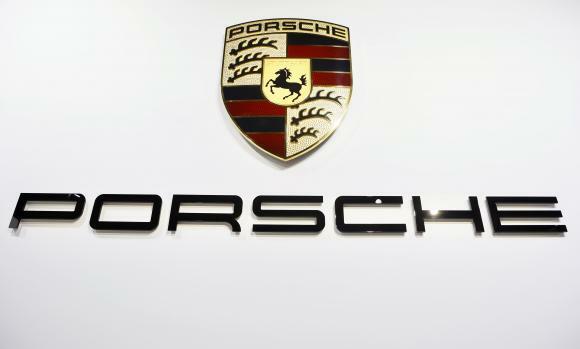 The Porsche logo is pictured during the 2013 Los Angeles Auto Show in Los Angeles, California November 20, 2013.